My family is the most important thing in my life, and being able to experience fatherhood is a complete blessing. I have 4 children the oldest is Nicole,18, then Briar, 16, Garrett is 12, and Gracee, 6. However, for me it was not as easy or as simple as I would have imagined. Something that made being a father difficult for me was that I also had an obligation to my country. As a medic in the U.S. Army I served for eleven years and was deployed twice. Honestly, there were plenty of times when I felt my service to my country interfered with my obligations as a father. For instance, I was blessed to be present the day my youngest daughter Gracee was born, but I was deployed 3 days later. What made it hard was that I knew I would be missing those precious moments that really matter to a parent, like hearing her first words or watching her take her first steps, and not being there for those moments is difficult. After returning from Iraq, I came home to find that she was now 1 1/2 years old and would not let me hold her, because basically she did not know who I was. I know my children understand that my commitment to my country is important, but that still does not change the fact that my absence did have an effect. My oldest daughter Nicole seemed to have some resentment for me not being around, but as she has gotten older our relationship has healed and progressed, and I can honestly say that it is as if we have never skipped a beat. I believe being a good Dad starts with the understanding that it is not all about one particular role. I have never seen it as just, “Did I teach them the right things?” or, “Will they always make the right decisions?” For me its about, “Did I give them the love they needed, while teaching them the lessons I have learned about life, and creating memories they can look forward to having one day with their children?” For me, those memories include coaching my youngest son Garret in Football and Basketball, and teaching my oldest son Briar how to drive a car. I really do not believe there is one thing that can make someone a good parent. It is trying to find a balance of love, respect, teaching, and encouraging that I think has the ability to mold a child’s character. I can only hope to lead my children to being a better person, worker, husband (or wife), and parent than I was. My children helped make me into who I am today and I attribute a lot of my success and accomplishments to my children because I live to make them proud. Now, this goes without saying; without the support and love from my beautiful wife Shalinka, I probably would have a completely different outlook on parenting. She is truly my rock and honestly having such a supporting spouse has made being a good parent quite easy. 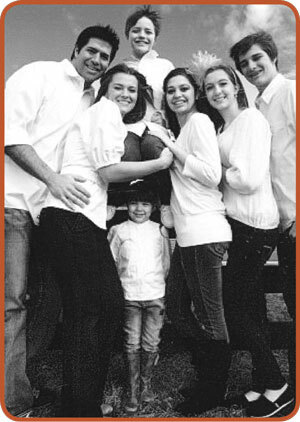 We have a great balance and understanding of our family values and we do our best to instill those values as a team. We feel communication is key in any marriage and we work hard to make sure we stay on the same page. I believe that goes for parenting as well, because kids are smart and they will try and play mom against dad, so being able to communicate alleviates misunderstandings that tend to arise. My family is my life and my love, everything I do I do for them, and I hope that my children will one day be able to cherish and experience the joy and happiness that having a family can bring. David Brickhouse was born in Annapolis Maryland. As a captain in the U.S. Army, he served for 11 years two as a medic, including two tours in Iraq. David holds a Bachelors and Masters from the University of Nebraska. He and his wife, Shalinka, have been married for 17 years and have four children. He founded Prodigal Primary Care, which has several locations in Knoxville, in 2010. Dr Brickhouse was the very best Dr & I have ever had the honor of knowing, he truly cared about all of his patients. He spoke often & highly of his family, he was a great, honest, caring & God fearing man, he will be so terrible missed. His passing has truly broken my heart in a way i cannot explain or understand! He had so many people that love & respected him beyond measure. Rest Easy Dr Brickhouse, You were taken far too soon, you made a huge impact on so many lives, I know you are in heaven looking down seeing all the love, respect & admiration so many people have for you, we will keep your memory alive & beautiful.